My little brother’s been on a wild road trip following the Bison around the Northeast corridor. 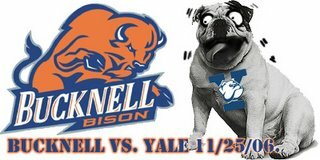 He requested a graphic to help the Bison overcome their 0-4 start as they head into Yale Saturday 11/25. This entry was posted in hoops, requests. Bookmark the permalink.